Alphagreen stands out from its peers by caring about the environment through the development of delicate ecosystems and the implementation of Global GAP standards. 1. Bekaa Valley during the summer season. 2. Coastal area in the southern region during the winter season. 80% of alphagreen production is exported to the GCC and EU countries. The rest is distributed to the local market and Alphagreen salad factory. - Quality is controlled and guaranteed from seed to salad. - Workers participating in the production process are well trained and follow strict hygiene rules. 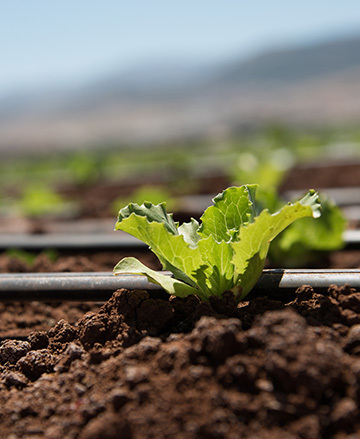 - The water used for irrigation is sampled on regular basis for microbiological and chemical testing. - All used pesticides are authorized for lettuce. - Lettuce samples are sent to an accredited laboratory in Europe to test the MRL on a regular basis.